Do you feel like jumping for joy at the thought of spring, sunshine and longer days? Maybe it's also time to remind other people how wonderful life is. 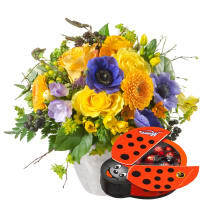 This bouquet is so packed with energy that it will shake even the grouchiest spring sceptic out of hibernation. 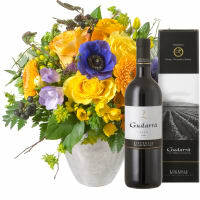 The bouquet contains roses and germini, combined with spring flowers. Have you always wondered what happens behind the scenes before a bouquet arrives in its recipient's hands? In that case, here's your chance to look over the shoulder of our master florist Marc Müller. 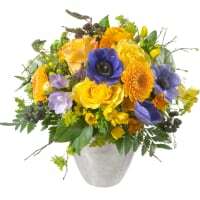 "I particularly love the colours and radiance of this bouquet. The combination with deep blue really brings out the bright glow of the yellow," he says. 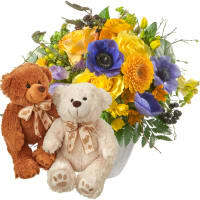 But watch for yourself as he composes a bouquet to lift anyone's mood.